Beautifully engraved certificate from the Choctaw, Oklahoma and Gulf Railroad Company issued in 1898. - 1901 This historic document has an ornate border around it with a vignette of a train and men moving bales of cotton. This item is hand signed by the Company’s Voting Trustee and Treasurer and is over 100 years old. Choctaw, Oklahoma and Gulf Railroad Company - Incorporated by act of Congress, provided "that the purchasers of the rights of way, railroads, mines, coal lease-holds, estates, and other property, and the franchises of the Choctaw Coal and Railway Company at any sale made under or by virtue of any process or decree of any court having jurisdiction thereof, shall be, and are hereby, constituted a corporation and shall be vested with all the right, title, interest, property, property, possession, claim and demand in law and equity, of, in, and to such rights of way, railroads, mines, coal leasehold estates, and property of the said Choctaw Coal and Railway Company, and with all the rights, powers, immunities, privileges, and franchises which have been heretofore granted to or conferred upon said Company by any Act or Acts of Congress, or which it possesses by virtue of its charter under the laws of Minnesota." In 1894, The Choctaw, Oklahoma and Gulf Railroad took over the Choctaw Coal and Railway Company and immediately launched a large scale expansion program. The gap between McAlester and Oklahoma City was closed in October, 1895. The El Reno to Weatherford extension was completed in 1898. The builders of the Choctaw then decided to buy the Little Rock and Memphis Railroad which had been organized by a special Act of the Arkansas Assembly on January 11, 1853. That line had been surveyed in 1854 and four years later the line had been completed from Memphis to Madison, Arkansas, 45 miles west. The next 40 miles to DeVall's Bluff, including a big bridge across the White River, was not completed until 1871. Later that year, through rail service was put into operation between Memphis and Little Rock. So, in 1898, the Choctaw, Oklahoma and Gulf bought the Memphis and Little Rock Railroad and then completed the Little Rock-Indian Territory boundary line trackage 151 miles long, including a bridge across the Arkansas River. The Choctaw, Oklahoma and Gulf then extended its Oklahoma lines to meet the Little Rock line. By agreement of April 1, 1904, the Choctaw, Oklahoma and Gulf, and practically all of its property, became the property of the Rock Island System. Purchased Choctaw Coal and Railway Company [11/30/1887] from George H. Earle, Jr., Sydney F. Tyler, Francis I. Gowen, George B. Kirkbride, and Nicholas Thouron, Trustees [9/8/1894] on 10/3/1894. Built from Oklahoma City to Mc Alester, Oklahoma, (120 miles) via Dickson, Choctaw, Harrah, McLoud, Sunnyside, Dale, Shawnee, Earlsboro, Tracy, Seminole, Lima, Wewoka, Holdenville, Bilby, Agua, Calvin, Hill Top, Stuart, Whites, Barnett (Haywood), and Dods by 10/1/1895. Built from El Reno to Weatherford, Oklahoma, (50 miles) via Fort Reno, Calumet, Geary, Bridgeport, McCool, and Hydro by ~1898. Purchased Choctaw and Memphis Railroad Company [9/15/1898] on 6/30/1900 for $1,621,500. Leased White and Black River Valley Railroad Company [1/10/1890] for 80 years on 7/1/1900. Leased trackage rights between Benton and Biddle (Hot Springs Junction), Arkansas, from Little Rock and Hot Springs Western Railroad Company [7/1/1899] on ~1900. Purchased the Tecumseh Railway Company [8/20/1896] on 10/12/1900 for $12,000. Built from Shawnee to Tecumseh, Oklahoma, (8 miles) via Spudland by ?/?? Built from Weatherford to Elk City, Oklahoma, (46 miles) via Indianapolis, Clinton, Parkersburg, Foss, and Canute by ~1901. Purchased White River, Lonoke and Western Railroad Company [2/2/1898] on 9/14/1901. Purchased Western Oklahoma Railroad Company [12/11/1900] on 5/1/1902. 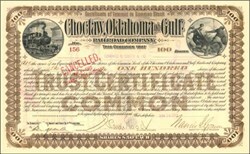 Purchased Choctaw Northern Railroad Company [3/22/1901] on 5/3/1902 for $1,027,500. Through stock purchase, controlled by Chicago, Rock Island and Pacific Railway Company (CRI&P #3) [6/2-3/1880] on 5/6/1902. Purchased Hot Springs Railroad Company [~1889] on 5/10/1902. Relocated line between Haileyville and Wilburton, Oklahoma, (17 miles) by ~1904. Leased to Chicago, Rock Island and Pacific Railway Company (CRI&P #3) [6/2-3/1880] for 999 years on 3/24/1904. Through stock 100% purchase controlled by Chicago, Rock Island and Pacific Railway Company (CRI&P #3) [6/2-3/1880] on <1912. Abandoned line between Lehigh and North Coalgate, Oklahoma (6 miles) on ~1923. Abandoned line between Watonga and Homestead, Oklahoma, (23 miles - Choctaw Northern alignment) on ~11/1926. Relocated line in Oklahoma City, Oklahoma, (5 miles) by ~1930. Abandoned line between Anthony, Kansas and Ingersoll, Oklahoma, (33 miles) on ~4/1937. Abandoned line between Frisco Junction and Pittsburgh, Oklahoma (84 miles) on ~1/1940. Consolidated into Chicago, Rock Island and Pacific Railroad Company (CRI&P #5) [12/16/1947] on 1/1/1948. The Choctaw, Oklahoma and Texas Railroad Company was chartered on June 21, 1901, by the Choctaw, Oklahoma, and Gulf Railroad Company. The Choctaw ran from Memphis, Tennessee, through Oklahoma City to western Oklahoma. The CO&T was organized to extend the CO&G from the Oklahoma-Texas border near Texola to Amarillo. The capital was $1,680,000, and the business office was in Amarillo. Members of the first board of directors included J. W. McLoud of Little Rock, Arkansas, G. L. Blackford of Denison, Texas, Francis I. Gowan and Charles E. Ingersoll of Philadelphia, Pennsylvania, and Squire H. Madden,qv R. L. Stringfellow, and Wiley H. Fuqua,qv all from Amarillo. In 1902 the CO&T built ninety-eight miles to Yarnall, and, by utilizing trackage rights over other carriers, reached Amarillo. The CO&T completed its own line into Amarillo by late 1903. By this time the Choctaw and its Texas subsidiary had been acquired by the Chicago, Rock Island and Pacific Railway Company. The CO&T was merged into a Rock Island subsidiary, the Chicago, Rock Island and Gulf Railway Company, on December 1, 1903. The CRI&G completed an extension from Amarillo west to the Texas-New Mexico line at Glenrio in 1910. Another Rock Island line extended from Glenrio to Tucumcari, New Mexico, where a connection with what later became the Southern Pacific created a through route between Memphis and the Pacific Coast.